Peter Velleno studied winemaking, brewing science, microbiology, and food engineering at the University of California at Davis. In 2003, he was the only student to graduate with a bachelor’s degree in fermentation science. After graduation, he went to work in the laboratory at William Hill Winery, where he quickly worked his way up to assistant winemaker specializing in Chardonnay production. Peter went on to work for the ultra-premium small winery Hartwell Vineyards, where he helped craft some of the most highly regarded Cabernets in the Napa Valley. 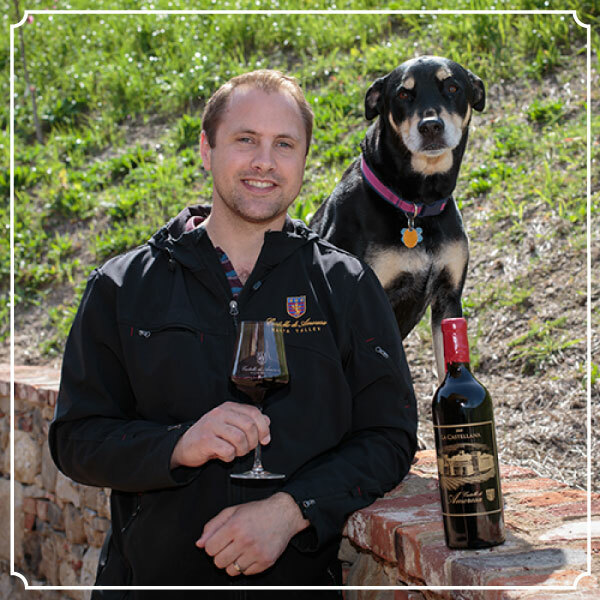 Peter’s career path took a sharp turn in 2008 when he joined Castello di Amorosa as the associate winemaker. He was promoted to winemaker in 2014 and manages production of the Castello’s wines. If asked, he will tell you that making wine in a Castle is even more fun than it sounds. Peter and his wife Lauren have lived in Napa since 2003. They have two children and enjoy playing tennis, biking, cooking, and spending time outdoors with their dog Nora.